In Baden-Baden, the first PYREG plant with steam activation has now been put into operation. 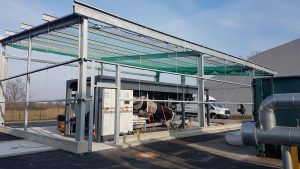 With the brand new PYREG plant A500, the city wants to test various regional biomasses for activated carbon production as part of the EU research project RE-DIRECT (INTERREG North-West Europe NWE). The plant periphery is currently still under construction. The first material tests are already being carried out in parallel. Participants of our RE-DIRECT conference will have the opportunity to visit the plant on 26.02.2019. Find out more here (in German). The conference aims at discussing the current state of play, sharing and learning from innovative practices, exploring ways forward for using regional biomass for circular products and economic transformation. 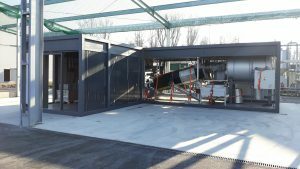 Apart from the one-day conference, you can visit the first large-scale IFBB-plant which has very recently been extended with a pyrolysis and activation unit for converting regional biomass to activated carbon. Moreover, the conference offers the opportunity for producers of alternative coal products to show their products in our market place. The market place will be open the whole conference day on 27.02.2019. 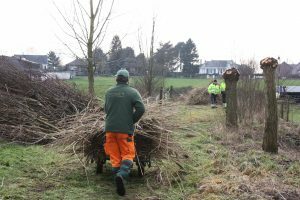 European Conference “Smart Use of Biomass for Alternative Carbon Products” taking place in Baden-Baden, Germany, on the 26th and 27th of February.